"This is who I am," he says simply of his growing music ministry. "It becomes who you are. It's your heartbeat. It's not just what you do -- it affects every part of your existence." 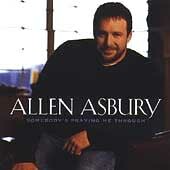 It was Asbury's 2002 debut, Somebody's Praying Me Through, which introduced audiences around the world to his emotion-packed vocals and heartfelt songs. The title track was quickly embraced by churches around the globe, and became the theme song in 2003 for both the Presidential Prayer Team and the National Day of Prayer. The album generated two number one songs, and a busy schedule for the new artist. But when it came time to begin work on his sophomore Doxology Records project, he was ready. Stand offered Allen the opportunity to sharpen his songwriting skills alongside some of the best, and expose his heart in the process. As a result, the personal commitment he feels to uplifting and encouraging the church is transparent in his music. "I've always been a songwriter," says Allen. "But I've felt like it's a skill that needs to be honed. So on this project, I sat down with guys like Dave Clark, David Robertson, Brian White, and Don Koch. It was songwriter boot camp," he laughs. Combining powerful vocals with melodic and message-oriented songs, Allen Asbury has created his sophomore project Stand. This project will build on a foundation of two #1 radio hits which included "Somebody's Praying Me Through" (2003 National Day Of Prayer Theme Song). Asbury has written on this project with songwriters such as: Brian White, Dave Clark, Michael O'Brien, and Don Koch. Songs include the hit "Life To The Living" and the classic "We Will Stand" featuring guest vocalist Russ Taff. As with his first release, Asbury's latest project is true to the heart of the church, from the modern spin on early 1900s hymn "This Is My Father's World" to the scripturally inspired and Asbury/Koch-penned "I Have Seen, I Believe," revealing a servant boy's view of the Lord's Supper. "You Are My God," co-written by Allen and singer/songwriter Michael O'Brien, not only reflects Psalm 86, but also the trials of a family friend. "Gail Terry was fighting cancer for quite some time," says Allen. "A friend went to go see her before she passed away, and she was frail and weak and had been through chemotherapy, and he asks her how she's doing. Facing death, she said, In this life, there's three things I've come to know for sure. Number one, life's not fair. Number two, I still believe. And number three, God is good. She summed it all up right there. Amazing." A well-loved classic also resurfaces on Stand -- in fact, the album title draws from the song itself. 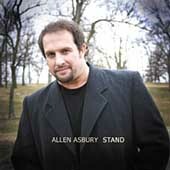 Blending powerful voice with powerful voice, Allen is joined by Russ Taff on the powerful "We Will Stand." "As a prisoner for the Lord, then, I urge you to live a life worthy of the calling you have received. Be completely humble and gentle; be patient, bearing with one another in love. Make every effort to keep the unity of the Spirit through the bond of peace" (Ephesians 4:13, NIV). Looking at this verse, I can see why walking in unity is so hard. It takes humility, gentleness, patience and bearing with one another. Sounds impossible. On our own it is, but notice that Paul calls this the "unity of the Spirit." The Spirit of God is the key to our unity. If we walk in unity with the Spirit of God, then we will walk in unity with each other. In the song "We Will Stand," Allen Asbury sings that as long as there is love we can walk together and stand against any enemy. As long as we love God and follow His loving ways we will be able to withstand any enemy to that love. "I didn't want to touch it because it is such a huge signature song for Russ," he admits of his initial reticence to record the song. "I wouldn't do it unless I had Russ's blessing, and honestly didn't think I'd do it unless Russ himself was on it. So Russ agreed to be a part of it, and Don's production of the song is tremendous. It's an honor to sing with Russ Taff -- that's a given. He's phenomenal." With wife Heidi such an integral part of his ministry, often traveling alongside him and occasionally translating his concerts into American Sign Language (ASL) as he sings, it was a natural for a song about their 11-year-plus marriage and continuing romance to make the album. His deep love and reverence for his wife is apparent as he describes the song. "Dave Clark and Don Koch helped me put this song on paper, and I have to admit it was a bit uncomfortable at first -- here's something that is so meaningful to me and so private," reveals Allen. "But I told them about Heidi, and some of those moments of our history even made it into the song, like our first date. This is a love song to Heidi, handing her my heart and saying, I believe this belongs to you." In addition to adding his writing talents to 5 of 10 cuts, Allen also took a larger role in the overall production of the album. With Don Koch at the production helm, he was able to contribute directly not only to the message and theme of Stand, but to the sound the project took as well. "A lot of kudos go to Don Koch, because he invested in my life," says Allen respectfully of the veteran songwriter and producer. "From the very beginning to the end, he allowed me to be involved. He'd turn and look at me, and say, Hey, what did you think about that? I took a hand in coming up with the way the songs are musically, with chord progression, programming ideas, being there for the string sessions and the players. I have a lot more appreciation for each song, because I had so much more involvement in it." Since the release of 2002's "Somebody's Praying Me Through", it would be no surprise to find that Allen has logged more than a few thousand miles on his frequent flier card. He's done what industry insiders might call "paying his dues" -- sometimes playing to crowds of thousands, other times not even a hundred. It's the life of a new artist, even one whose debut has been lauded as "the arrival of a major new talent" by heavyweight Billboard magazine. In early 2004, Allen returned from a trip to Korea, where Allen reprised his role as Simon Peter alongside a cast of over 200 in the play The Promise. Having spent over a half decade as the Biblical rock in the Branson, MO, production of the drama, it was awe-inspiring to take the stage for four performances at the Olympic Stadium before an estimated 200,000 Koreans. "Words, pictures -- none of it will do the experience justice," says Allen. "At the end of each night we would do a curtain call and go downstage, and the response of the people was overwhelming. But the most amazing thing was that as soon as the show was over, this mass choir of about 2,500 people started into the Hallelujah Chorus. I have to tell you, this side of Heaven, it is the closest I will get to angels. It brought tears to my eyes." It isn't the miles he's traveled nor the dues he's paid that have brought Allen to his sophomore Doxology Records project, Stand, and the contentment that registers on his face. Don't count accolades or accomplishments in the ranks of those things that make this man truly happy. Instead, weigh the lives of those who have been touched by the songs he sings -- or even more, the people who have touched Allen along the way. "It means a lot to me to know that some way, somehow, what I am doing is making an impact in other people's lives," says Asbury. "But then again, I've been places where I'm supposed to be the one giving in ministry, but somehow it turns back around and comes back at me, and I'm the one that has received and walked away feeling refreshed and renewed." The past few years have indeed been a whirlwind of ups and downs, says the artist, but God's grace puts it all in perspective. Back in the mid-80s, Allen took a tour of mega-church Crystal Cathedral as a spectator. Just last year, Allen found himself on the ministry's stage singing "Somebody's Praying Me Through," backed by their mass choir and orchestra. Still pinching himself, he took a different kind of tour during this visit. "I had just sang with the choir and the orchestra, and I was on this high. And as we're walking around, taking a tour of the place, a lady comes running up yelling my name. Breathlessly, she asks me to sign her CD, and as I take it into my hands to sign, she says, I want you to understand what you're signing. This CD is for my son, who's in the military in Iraq. I'm going to send this to him and I want him to know that his mother and father are praying him through." Allen pauses, obviously overwhelmed at the role God has given him to play, even if only in one life. "When something like that happens, it brings everything into perspective. It helps me to realize why I'm doing this and Who this is really all about." If you find yourself at odds with another Christian, stop and ask yourself if you are at odds with God. And if you have done all you can, in patience, gentleness, and humility, then bear with them. Don't get offended. Don't get angry. Turn to the Lord and let His love love them through you.